“These jars came from the same factory, were made of the same materials, and can hold the same amount. But they are different,” he explained. Then he upset one and it oozed out honey. He turned over the other, and vinegar spilled out. When a jar is upset, whatever is in it comes out. Until the jars were upset, they looked alike. The difference was within, and could not be seen. When they were upset, their contents were revealed. What if someone tipped you over today? What if someone comes on the wrong way and causes a dent on your car or makes a scratch on your bike? What would flow out? 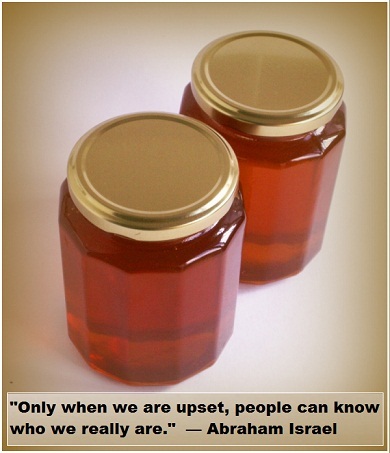 Would you reveal the "honey" of grace and patience, or the "vinegar" of anger and sarcasm? "Above all, love each other deeply, because love covers over a multitude of sins" (1 Peter 4:8). Unless people see the honey of God's love, grace and patience flowing out of us, they will never come to understand God through our lives.